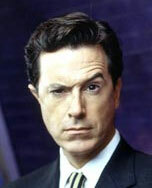 Stephen Colbert has been just outstanding lately. Mr. President, usually you and the politicians are the ones in the cross-hairs at this dinner. Tonight, no one is safe. and, indeed, no one was … except, maybe, Helen Thomas. Colbert is so good, he even has Tom Delay fooled [via thinkprogress]. Really? America must be great. There’s no telling the lengths to which a would-be comment-spammer will go, to flatter his host. This amuses me, first because unsigned commenter URLs are automatically rel="nofollow"ed and second because I keep removing his spamvertised URL anyway. Ok, pinch me. I read the by-line as “Brad Sears” and took the comment seriously.